I’ve managed to get our PF up from about 0.6 to 0.94. The power meter now reports Watts and VA as almost equal. Harmonics and distortion on the mains will also be reduced. It will be interesting to see if this affects the billing. Be careful with mains power. I am an electrician. You don’t want to do anything that is unsafe or may cause a fire hazard. Just because it complies with the rules doesn’t mean it is safe or a good idea. You must always apply common sense, good design and good installation practices. Over the past couple of years as I have reduced our load, the cost has stayed about the same. I suspect this is because of the types of load we now have and how it is metered. My main interests are 1. to reduce the power bill, 2. to reduce our load and reliance on the grid. Off-grid energy storage would be great but s not yet practical or affordable. So I have again recently (February 2016) been thinking about our power use here at home; watts, power-factor etc. We pay about NZ$0.25 per unit including units-charge, line-charges and tax. According to the billing we use about 22-25 KWh per day summer to winter. In winter we use more power, but for heating it is more accurately metered as the PF is better. During summer a larger percentage of our load is switch-mode power supplies and I suspect the metering works to charge more for the energy supplied. Depending on how the metering works, a poor power-factor could increase the cost. Switch-mode power supplies can now include “power factor correction” (pfc) but not all do; it is not a requirement here yet. A poor power-factor suggests that the AC current waveform is out of phase with the voltage waveform. So for a certain power you need more current, If the metering is looking at VA (voltage and current) rather than Watts you may be paying for more than the Watts you are actually using. This could be considered fair enough, as the grid system has to be able to supply the current and your load is drawing more than it probably should. Switch-mode power supplies are a bit different. Without active-pfc, they draw current only at the peak of the AC voltage cycle but in-phase. The power-factor appears to be perfect (1.0) but the peak current is much higher to achieve the same useful power. Power-factor-correction in a switch-mode power supply spreads the current draw over almost the full cycle and reduces the peak current draw. This makes it look more like an ideal resistive load. So when I spotted these meters on Ebay I got one. Mounted on the switchboard it displays instantaneous Volts, Amps, Watts, VA, pf. Accuracy is claimed to be +/- 2%. Good enough for me. After keeping an eye on it for a few days, it suggests that our power use and standing load were more than I would have expected, and the indicated power factor not good; mostly hovering between 0.7 and 0.8. If we are paying based on watts rather than VA (pretty sure we are), this accounts for quite an increase. It’s quite likely that the high-peak but in-phase current draw of many switch-mode power supplies without pfc is to some extent confusing the meter. Depending on how smart it is (probably not very) it may be looking at the peak current or may be averaging it. Our short term high-power loads are mostly resistive, hot-water and stove. The fridge and freezer are cyclic inductive loads. I think the microwave oven has a Switch-mode supply as it’s not heavy enough to have a large transformer. The rest is almost all electronic load; switch-mode power supplies, even the LED lighting. 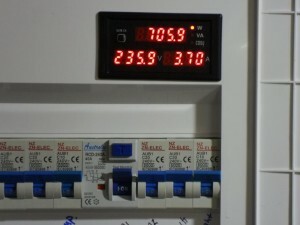 What I call “the computer cabinet” accounts for a 24/7 220W load and is already fitted with “active power factor correction”, which I assume works (see below). It also has a solar panel that provides up to about 150W mid-day on a good day. The other significant load is my main work computer + monitor which runs every day for most of the day, draws about 120 watts, but without active-pfc. A lot of switch-mode power supplies ranging from small 5 watt plug-packs up to TV and computer supplies are all connected together and all draw current only at the peak of the AC voltage waveform. This produces a distorted current waveform and produces harmonic noise on the mains. In some countries power-factor-correction is required within all power supplies above a certain wattage (20 watts ?? ). I have just finished identifying all our circuits and load testing a few items. While the power was off for about an hour, the computer cabinet was running on battery and solar; although it’s overcast so the solar only contributed 50 watts or so. The computer cabinet runs everything from a nominal 24V. The 24V comes from two switch-mode power supplies, which are supplied with approximately 350VDC from a active-pfc front end in a re-purposed 600 watt PC power supply. So the mains current waveform should always be close to a sine waveform and in phase, for a good PF. But the power meter reported about 175 W, 297 VA and 0.6 PF. I found that when the ATX output side of the PC power supply was not turned on, the active-pfc was disabled; bypassed for the standby supply. Turning on the output side (luckily I installed a switch when I built it), the pf improved from 0.6 to 0.93. I also noticed that the meter is a bit dodgy at very low loads; 1.2 W, 19.7 VA and 0.06 PF; but this is not unexpected. It looks like my low-power computer plus the 39″ monitor draw about 120 watts. The computer cabinet draws about 220 watts, but was a 190 watt solar panel contributing some; about 30 watts when tested and overcast. Computer cabinet with pfc-off = 0.6, with pfc-on = 0.93. Adding active-pfc to computers/monitors and LED lighting would be an improvement. Most switch-mode supplies will operate from a 350VDC supply, as they simply rectify the incoming 230VAC mains anyway. Adding external active-pfc is not difficult but you must not do anything that may be a safety or fire hazard. The LED lighting should ideally be converted to low voltage and powered from the 24V supply in the computer cabinet. I tried adding some pfc capacitance to the mains but it made the indicated power-factor worse. Possibly due to it causing the current to lead the voltage because the initial problem is distortion rather than phase error.